A 72nd minute goal from Millwall’s Jake Cooper gave Millwall a deserved 2-2 draw against top of the table Wolves at the Den in an exciting game down in South London. This was a great result for the Londoners against the top team in the division by a country mile and Millwalls doggedness and eagerness saw them over the line. Definitely a home point gained than two lost for Neil Harris’s team. It was a lusty affair with tackles flying all over the arena. Yet with only 37% of the possession the home team held on to thwart the visitors who certainly looked ready made for the Premiership next term. A victory in South London would have seen them floating a massive 10 points clear of nearest rivals Cardiff City, however the Welshmen came a cropper with a 4-2 home defeat by Fulham whilst Bristol City took second position with a comfortable 2-0 win over Reading. Reading’s defeat and Millwall’s plucky draw saw the two teams change positions in the table with Millwall up to a lofty 16th place. 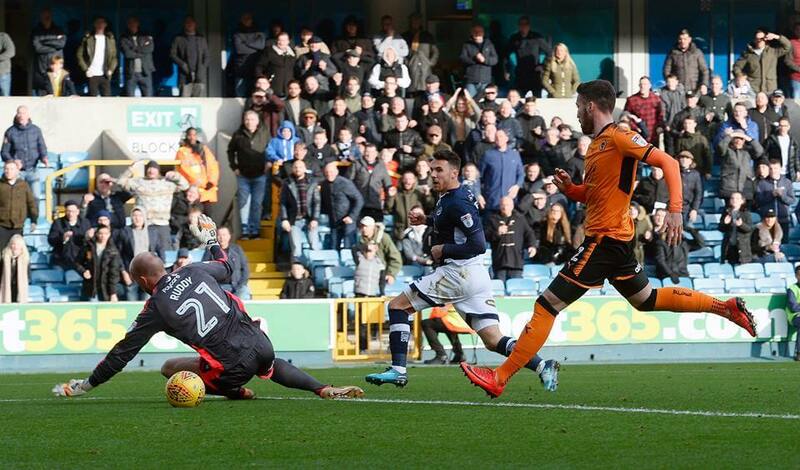 Millwall did it the hard way caming from behind to claim a point as Wolves failed to win in the capital for the third time this season. Former Wolves player Jed Wallace’s led a counter attack and his pass set up Lee Gregory to put Millwall in front on 17 minutes. I’m surprised teams haven’t learnt this from Millwall in the last month or two as Millwall are so heavily reliant on the ever running Gregory usually up there alone in attack. The fact the away team had 63% of the possession does suggest Millwall’s defence are standing up well to everything thrown at them and Wolves are the best in breaking down barriers in this division. Recalled Helder Costa for Wolves then set up Diogo Jota’s first half injury time equaliser before supplying the pull back for Romain Saiss’ magnificent 25-yard strike before Jake Cooper levelled with a close range header on 72 minutes. Wolves failed to deal with a far-post corner, as Shaun Hutchinson was allowed to direct a looping header back across goal and Cooper got there first to bundle in a header. Nuno Espirito Santo’s Wolves are now on a 10 match unbeaten run since losing to QPR at Loftus Road in late October – and they were also held to a goalless early season draw at Brentford. So the midlanders aren’t fond of popping down to the capital. Wolves had not conceded a goal in four matches prior to this game but it was end to end stuff with Millwall always looking dangerous and speedy on the counter attack but Wanderers, who boast one of the best home records in the bottom half of the Championship deep in the Lion’s half for great periods of time. The game turned round in the space of 11 minutes either side of half time yet Neil Harris’ team had the fight and strength of character to grab another point on a ground where they have lost just three times in 12 matches this season. Away from home this season is another story of course. 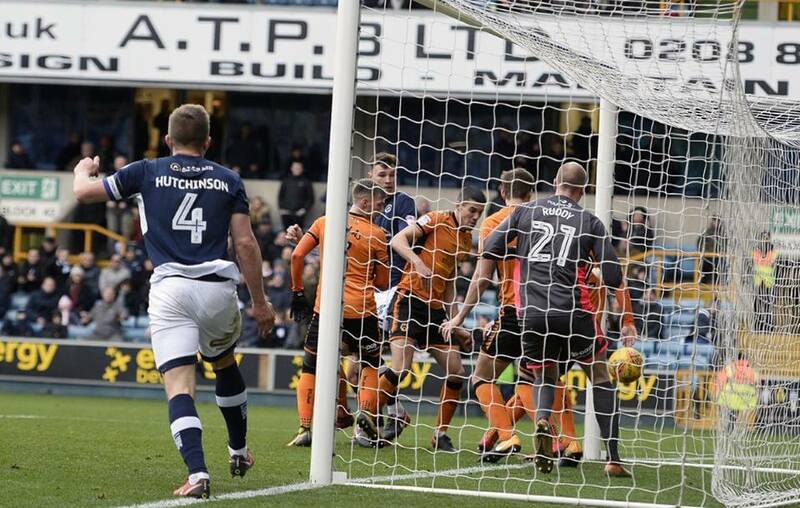 Wolves almost snatched it at the end and were close to claiming all three points in the third minute of stoppage time when Millwall keeper Jordan Archer pushed away a decent Barry Douglas free-kick. “Against good teams, if you switch off you’re going to get punished. We switched off about three times, probably, in 90 minutes. We gave it a right go and our second goal was well earned. I’m really pleased with a point – no one was short-changed in the crowd, that’s for sure. “It’s not an indifferent result, 2-2 against Millwall away from home. I knew that Millwall would be like they were. They’ve got 21 of their 27 points at home. It’s a tough environment to play in. We showed a lot of character and we can be proud of ourselves. Is the Title Race Over?